Abstract: The shortage of skills in the academic sector is a reality. This has led to the excessive work overload for the few academic staff available, leaving them less time to pursue further training and develop their carrier. Furthermore, the excessive work overload means academic staff have less time to learn and use educational technologies that could assist teaching, learning and knowledge sharing, and to seek best practices for the implementation of such educational technologies. Efforts towards alleviating skills shortage and encouraging knowledge sharing as well as the need for e-learning and Learning Management systems can not be over-emphasized. 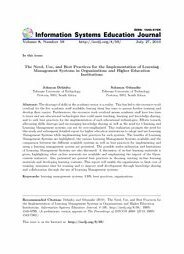 This realization prompts the need for this study and subsequent detailed report for higher education institutions to adopt and use Learning Management Systems while implementing best practices for such systems. The benefits of Learning Management Systems are highlighted, the various Learning Management Systems available and the comparison between the different available systems as well as best practices for implementing and using a learning management system are presented. The possible under-utilization and limitations of Learning Management Systems are also discussed. A discussion of on-line learning materials is given, highlighting what on-line materials are available and emphasizing the impact of the Open-content initiative. Also presented are general best practices in choosing existing on-line learning materials and developing learning contents. This report will enable the organization to limit cost of training, maximize time for training and to improve staff development through knowledge sharing and collaboration through the use of Learning Management systems.